You need to plan on bugging out if you live in an area that is prone to being hit by a hurricane. 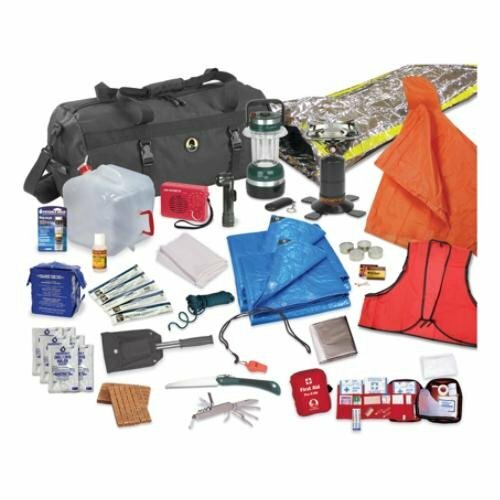 Following is what I use for my hurricane bug out bag list and it has worked well during several evacuations. I keep updating it each time we have to bug out and run. And no, riding out a hurricane is not fun or an option for my family anymore. Hurricane Ike was the last one we rode out but not anymore. Get a water-proof plastic box or bin and put all your paperwork in it. Do this well ahead of hurricane season. We keep all of our vital records in ours at all times. Once we get ready to bug out, it takes about 3 seconds to grab our vital records and pack them. Medical Records - Having a copy of your medical records is highly advised if you have special medical needs. Once you evacuate along with everyone else, there is no way for another doctor to verify or check your medical history and this could be vital in an emergency. Insurance Papers - Put at least a copy if not the original of all your insurance papers in one water-proof plastic box. Keep these records together so you can grab them and go. Titles for house and cars - You want to have all of your titles and proof you own stuff in one place, this includes houses, cars, truck, trailers, boats and anything else that requires proof you own it. Bills - Keep the latest copy of your bills. If you are gone for an extended time, you'll still be able to pay your bills and not get into a bad credit situation because you don't pay them on time. Sure I realize that with todays access to electronic means that this almost seems old-fashioned. But believe me you don't always have access to the Internet even if you have evacuated to a safe place. Writing a paper check and throwing it into an envelope with a stamp might keep your credit history from tanking. Stamps - Get a 'book' of the 'Forever Stamps' from the post office. They might very well come in real handy. Keep some postal envelopes in your bin also. Stocks and Bonds - Keep your stocks and bonds in your vital records box so they travel with you. Getting them wet will destroy them and then there goes your retirement. Marriage, Death, Divorce Certificates - These are handy to keep up with. Not as vital as some of the other stuff but are important when you least expect it. Identification - Drivers License, Passport and other identification is vital to proving who your are and as to where you live. Keep these current. When trying to get back to your house, having your driver's license with your current address on it is vital. The roads will be likely have state troopers, national guard and local law enforcement blocking them. If your driver's license is out of date and shows you living somewhere not in the hurricane zone, they most likely will not let you back in. Cash - Yep you need some good ole cash. After a hurricane, with no electricity working your bank card and credit card is worthless to you. Have cash stashed. After Hurricane Rita, I bought gas from an ole feller that had a generator running at his gas station with one pump working. With no landlines working, there was no way to use my debit card. Cash is king during an emergency. Electronics - You want to keep all your electronics in one place when possible so that when you bug out, you can grab them and run. This includes chargers and batteries for all your devices. We keep most of our different charges in one kitchen drawer. When bugging out, check your list and when it comes to electronics, you can empty out the drawer you keep them in and are ready to go. Keep a couple of zip-lock plastic bags in the same place so you can put them into something water-resistant. Firearm Paperwork - Put a copy of your bills of sale and Concealed Carry for firearms in here. You really, really don't want to get pulled over during a hurricane emergency and not be able to prove you own your firearms. Believe me, I've heard horror stories of people losing their firearms due to lack of paperwork when coming back into an evacuation area. You can pack your own bug out bag but buying a commercial one will save you time and money. Modern day ones are really nice because they have most of the essentials you need in a compact, easy to carry backpack. Once you do get one, inventory it and make sure to keep note of what you need to add to it. Also make sure everything is there and actually works. This backpack is really nice. It is large enough to hold everything you need, but is lightweight and rugged. Pack your emergency supplies in it and when you get ready to go, grab it and you are all set. Food - Keep enough food in this for at least 72 hours for each person bugging out with you. Water - Most officials recommend around 1 gallon of water per person per day be on hand for 3 days supplies. You do need to rotate this water supply. Normally most water is good for storage for 3 months. Cooking Supplies - A couple of pots and pans that are lightweight are great. You want to be able to heat up food and water if needed. Fire Starters - Hopefully you really want need to use these. After Hurricane Rita I came back the day after to check on my home and report to work. No electricity meant the stove was out. I couldn't find the grill lighters we use for the charcoal grill as they had been stored outside and were blown away during the storm. Easily enough, I popped open my bug out bag and grabbed my fire starter and was good to go. Maps - Keep maps of the local area and maps of the area you plan on evacuating too. GPS and smart phones are great. But if you can't use them because all the cell towers are down, good ole, paper maps always work. Bedding - Keep a couple of blankets at least in your bag. Sure it is going to be hot when a hurricane hits but a couple blankets can really make you feel better when it gets cooler at night. Mosquito/Bug Spray/Netting - You will be inundated with mosquitos about 3 days after a hurricane has left your area. It is really bad down here by Houston were we live. Get a good DEET mosquito spray. Netting for your head and face can really make things easier also. Medicine - Along with some generic pain relief, make sure that you have at least a 3 day supply of any life threatening medicine. 3 days is minimum but a 30 day supply is what you really want. Before a hurricane hits, get with your doctor if needed but get all your prescriptions filled with a 30 day supply. First Aid Kit - Buy and learn to use the items in a good first aid kit. Buy and put anything that is essential to your health in it. Clothing - Carry a couple of changes of clothing. Especially pack several changes of socks. I don't know why but when my feet get wet, I feel like crap. You will find it rains a heck of a lot before, during and after a hurricane. Make sure you have rain gear. Waterproof boots are really nice and go a long way to keeping your morale high. Batteries/Chargers - You want batteries to keep your stuff working for at least 72 hours. For batteries, you will have to rotate them about every 3 months. As soon as batteries are made they start losing their charge. So don't buy a huge amount and expect to keep them for years until needed. Rotate them and keep buying new ones periodically. Keep all your various electronic chargers together so you can grab them and go. Compass - Get a compass and learn how to use it. Keep it near your maps of the area. Hopefully you will never need this but if you do need it in an emergency, it will be vital to be able to use it. Shelter - This is one item that is in every bug out bag. Or it should be. Getting caught in the open with no shelter is one way that can kill you. Sure it will be hot when a hurricane hits. But it is also going to rain a dreadful lot. If you have to leave for some reason, having some sort of small tent to keep the rain and mosquitos out is essential. Wire/Rope/Duct Tape - Pack a variety of small rope and some wire. I like to keep the electric fence charging wire around. It is flexible, strong and comes in a 1/4 mile roll. More than enough and very, very useful. And you can't ever have enough duct tape can you. Be sure to check your duct tape from time to time and make sure it hasn't gotten so hot as to stick together and become useless. Radio - This is really essential if you have any plans of riding out a hurricane or coming back into the area immediately afterwards. I've come in right after hurricanes as a first responder and it is really bad to be in one of these areas but have no idea as to what is happening. Being able to hear from outside the area can really help you stay safe. Lighting - Carry plenty of flashlights and batteries. Glow sticks are useful also. Knife - You'll want to have a variety of knives in your bag for different tasks. I like to keep a 3 inch, 6 inch, 12 inch and machete along with a small axe in mine. Firearms - Ensure your firearms are ready to go at all times. Pack enough ammo to last at least 72 hours. How do you know how much ammo you'll need? You don't. No way you can judge that. Just pack 'a lot'. Also don't forget your cleaning kits. Put all firearm paperwork in your vital records bin as I wrote above. Survival Book - Get a good paper Survival Book and keep it in your bug out bag. You most likely won't need it but they are invaluable if you do. When sitting around with nothing to do because all the cell towers are out, read some of it. They are quite entertaining and may actually prove useful. For your pets, take your pet carrier to help constrain them. Plus if you use a crate for your dog or cat on a regular basis they will be more comfortable when traveling when in it as they recongnize it as a safe place. Carry enough food and water to keep them healthy. You'll need at least a 3 day if not a 30 day supply of medicine if they need it. Collar and leashes will let you let them out to exercise if you get stuck somewhere. Don't wait till the last minute to get them used to collars and leashes. You will be surprised in the wrong way as most animals take some time to get used to these. Lots of great ideas for being prepared for an emergency.